Book Review Message from the Exterior By Karen Jenkins Reviewed by Karen Jenkins “Ruwedel has a keen eye for the potential in absence. He has long honed in on the faded traces of human presence and intervention in the landscape, manifesting the humble remains of our aspirations and disappointments. " Message from the Exterior. By Mark Ruwedel. Mack, 2016. Mack, London, England, 2016. 184 pp., 6½x9¼". 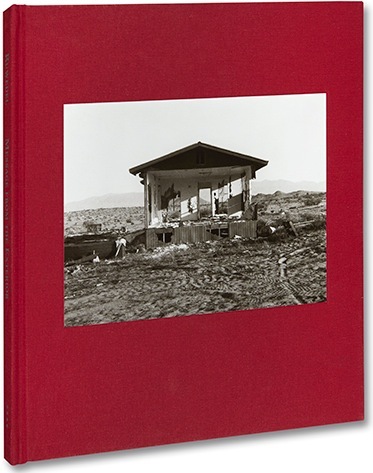 “Just because you wander in the desert, it does not mean there is a promised land.” Paul Auster’s elegant admonition is an apt opening to Mark Ruwedel’s latest collection of photographs, Message from the Exterior, born of trips into the desert expanses surrounding Los Angeles. His subjects are the ephemeral dwellings that dot these sparse environments — both the shabbily-solid and barely-there structures once occupied by unseen passers-through. Ruwedel has a keen eye for the potential in absence. He has long honed in on the faded traces of human presence and intervention in the landscape, manifesting the humble remains of our aspirations and disappointments. In his twenty-five year series Westward the Course of Empire, Ruwedel depicted remnants of railroad lines that first cut through the American West in the mid-nineteenth century, in faint impression and deep cleft. The photographs in his work Crossings draw attention to the abandoned personal items and detritus that are stand-in and testament to migrants who strive for an invisible passage. Similarly, the structures depicted in Message from the Exterior are touchstones to itinerant hopes and dreams and their uncertain ends. Ruwedel’s photographs of these solitary, rudimentary domestic structures speak to the desert’s provisional allure — why its temporary inhabitants might want to touch down or slowly, inevitably move on through. His default formal approach of centering each shelter in the frame at a middle distance creates a certain typology in which commonality yields to variations on the theme. The relative degree of physical soundness and permanence of each house emerges. Some structures have the bland heft of the cinder block. Others are cobbled together with a patchwork of found materials — plywood, metal sheeting and plastic. The desert sunlight renders some among them impenetrable — dead ends of bleached-out, flat expanse. Others you can move right through, in a transparency of design or decay. Every image, every house feels transitional, like their absent occupants and Ruwedel’s own shift from daylight to dusk. As the sun sets, flaws are softened along with our judgment — distant mountains are lit up and framed out in sections of skeletal structure and shards of broken glass catch a gorgeous silver reflection of the clouds above. The shifting relativities of these homes — good enough, safe enough, just long enough — are conjured like watermarks embedded in each view. While much about these structures and locales defies conventional notions of home, one by one, they nonetheless instigate a consideration of fundamental themes — permanence, ownership and identity. Façade after façade commands our attention, and then slowly, the occasional foregrounded bit of shrubbery or straggly tree become a disjuncture to an otherwise unobstructed view. This prompts a pulling back, a shift of attention to the peripheral. Here there are sometimes runs of fence or sketched out stone borders — the vague suggestion of a demarcated personal space beyond the shelter itself. In one image, two tattered stuffed chairs sit out front. While the inhabitants may not have settled in to watch the world go by, they did establish their point of view. The chairs are a reminder that the looking goes both ways. There’s another landscape over our shoulders — a sweep of desert, a mountain and a view to what’s next.